Are you craving chocolate? Go ahead, give in! Cacao--raw chocolate--often referred to as "food of the gods" is high in antioxidants. It is also an excellent source of magnesium, iron, chromium, manganese, zinc, and copper. A good source of omega-6 fatty acids and rich in heart-healthy oleic acids, it will boost your mood, improve cognition and help lessen stress! Sounds too good to be true. But it isn't, as author Matt Ruscigno explains, this hot superfood has powerful benefits. Then Matt gives you what you really want-recipes for chocolate! 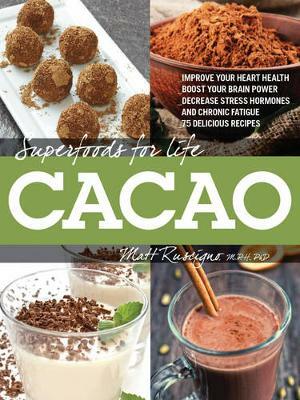 Superfoods for Life, Cacao contains 75 recipes for sweet and savory cacao recipes--from main dishes to desserts--including Huitlacoche-Chocolate Empanadas, Cocoa Buffalo Tempura Vegetables, Dolmathes with Currant-Chocolate Rice and Cacao Tzatziki.